Tickled Pink Stamps is having a Rip something challenge and I thought it would be a great challenge to join. 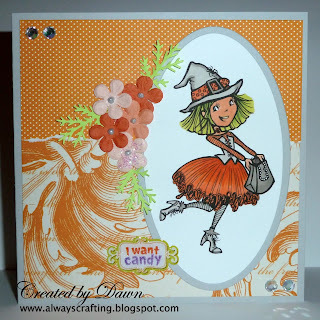 I used Lil Pinkette Witch Audrey image from Tickled Pink Stamps. You can find this image here. She's KAYOOT! I love how your paper flows towards the flowers like that! Spectacular indeed! Great job with our challenge this week at TPSC! Best of luck with the GDT call. You're definitely in "orange" mode at the mo Dawn!! Great card Dawn, love the orange colour combo. Pink Cat Studio's cool new innovation! Hambo Hoedown Hop - "Sing Your Art Out"